1. Preheat the oven to 180°C/ 350°F/gas mark 4. Grease and line two 20cm sponge tins with baking parchment. 2. In a mixing bowl, whisk the eggs and sugar together until pale, creamy and double in volume (ribbon stage). 3. Fold in the flour and cocoa, bit by bit, using a large metal spoon, repeating until all the flour is combined. Fold in the salt. 4. Divide the mixture between the two lined tins and bake for 20 minutes until well risen. Remove from the oven, then turn out onto a wire rack and leave to cool. 5. Set up a bowl over a pan of hot water and add half the broken-up Easter egg shells (1 chocolate egg) and leave to gently melt so the chocolate is just warm and runny. 6. Whip the cream, caster sugar and cocoa powder together to form soft peaks. Place one sponge base on a large plate then take one third of the cream mixture and put in a separate bowl. Pour and fold in half the melted chocolate and spread over one of the cooled sponges, scatter over some broken chocolate pieces then top with the remaining cooled sponge. 7. Now it’s time for the fun part! Take a palette knife and spread your cream icing all over the cake. For a top tip, to create a smooth finish, when the sponge is covered, pop it in the fridge for 5 minutes to firm up the cream, then remove. With a hot pallete knife (one that has been heated up in some boiling water), smooth the edges and the top! 8. Take the remaining cream icing and pop in a piping bag. Decorate by piping around the edge of the top of the cake and around the base. 9. 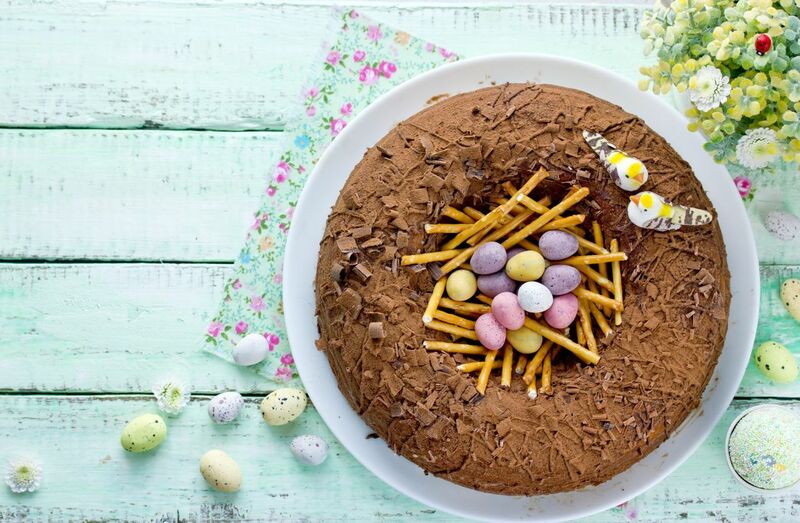 Using a triangle of greaseproof paper, make a small piping bag and fill with the remaining melted chocolate - then pipe ‘HAPPY EASTER’ on top of the cake. For a showstopping finish, break up the remining chocolate shell pieces and scatter on top and around the cake!